The history of early electronic instruments is strewn with colourful and mysterious names, amongst the best remembered being Ondes Martenot and Theremin, but there were notable others. Some remain obscure to this day, such as the Spherophone and Partiturophone, but others are better appreciated — for example, Friedrich Trautwein's Trautonium. Dating back to the 1930s, the Trautonium's capacity for eerie pitch-slides invites comparison with the Theremin, but in terms of how it's played, it's closer to the less-known Electro-theremin, or Tannerin. In the works of Paul Hindemith and Oskar Sala, the Trautonium grew into an expressive and distinctive solo instrument that later evolved into a more complex source of experimental sounds ideal for science fiction and horror movies. But it's the sound and style of the earliest machines that have inspired German company Trautoniks for their Trautonium VT2012. The Trautonium's pitch is determined by the position of a finger on the metal resistor wire and its volume by how much pressure you apply. The Trautoniks Trautonium VT2012, which I'll refer to as the Trautonium for convenience, is a monophonic analogue synthesizer-like instrument played by the action of fingers on a metal resistor wire. The wire is mounted on a metal plate, referred to as the 'manual' or 'playground', the whole thing set on a tilting metal arm hidden inside the box. The pressure applied when you play a note determines its volume, so it's that rare combination of expressive to play but simple to grasp. 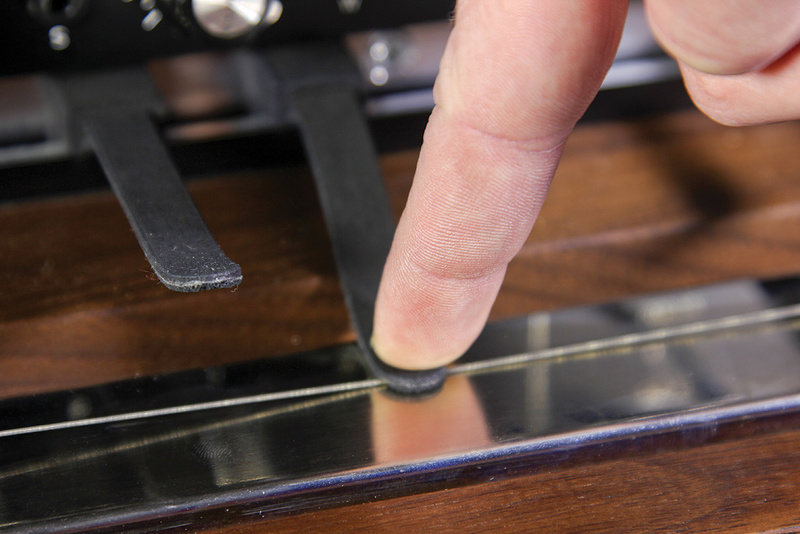 Unlike the Theremin or Ondes Martenot, the Trautonium requires only a single hand — and musicians will always put a free hand to good use! The arm is sprung quite strongly and with a solid resistance, but this is necessary so that the Trautonium can deliver fast, staccato notes. It felt a bit weird the first time my finger pushed down hard and the entire manual sank into the wooden frame, though! There's also a degree of rattling to get used to — especially if you happen to be inclined towards vigorous tremolo or vibrato — but the structure felt able to cope with any excesses of mine very comfortably. 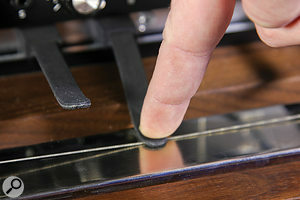 Apparently, the original Trautonium from 1933 had a dynamic stretch of just 2mm and was very stiff. Although labelled in German on the panel of the review model, most of the controls should be fairly obvious.I've been fortunate enough to play some high-end instruments over the years but I instantly recognised the Trautonium as amongst the most luxurious. 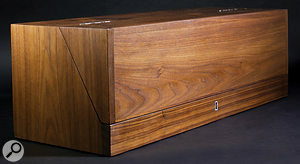 It's housed in a dark cabinet of polished walnut, with a hinged lid that folds back to form a music stand. Although of modern design, the shape and look is tastefully consistent with Trautoniums of old. The VT2012 would be quite at ease in your maiden aunt's lounge, at a classical concert or a Björk gig. At around 12kg, and costing almost €5000, this is in no sense a lightweight instrument. Measuring 74 x 26 x 25cm, the cabinet is as sturdy as it is plush, but you'd want to keep it well protected on the road or in the studio. The all-important wire is 70cm long and strung between two terminals. I'm assured that, with care, it should function for decades but a spare is supplied too, just in case. The Trautonium is labelled in German front and rear, but even without the manual I was able to spot 'Ausgang' as the main output, on its single balanced quarter-inch jack. There's a volume-pedal input and two CV outputs further along, one each for pitch and volume, plus a gate output. Mains power is supplied via a standard kettle lead and when the row of LEDs light, you're ready to trot, or trout. Trautoniks have been building Trautoniums for over 20 years and while the example reviewed here is a prototype, it varies from the final version only in a few minor details, such as wiring and labelling. Further down the pipeline, a CV/Gate controller version is planned, to be followed by the more ambitious Mixtur-Trautonium (a two-manual version with dynamic filter control) and a sound module. At the back of the Trautonium are quarter-inch jack sockets for the main output and volume-pedal input, a row of power LEDs, a pair of CV outputs and a gate output, and a standard IEC socket for mains power. Gazing over the large-format knobs and switches, there's a sense of stepping back to the dawn of electronic music. Although you can specify an English-printed version when ordering, I found the German text helped instil a feeling of imminent discovery. There are five sections in total: Generator, Sägezahn, two Formant-filters and finally Ausgang (output). The Generator section deals with the instrument's pitch and its response to dynamics. The knobs 'f-grob' and 'f-fein' are the coarse and fine tuning and a large switch (marked 0-2) shifts the oscillator in octaves. Since coarse tuning provides almost an octave of shift itself, the playable range is well beyond five octaves. In terms of dynamic response, if you turn the (unlabelled) sensitivity knob to its maximum, you can hit full volume with only a short depression. If your fingers are up to the challenge, backing off the sensitivity maps the maximum dynamic range to the arm's full travel. In this section are two trim-pots that are used when adjusting and servicing the string and recalibrating the distances between octaves. Finally, an LED lights in green whenever you play a note. This also indicates that a Gate signal (0-5V) has been generated at the rear jack. The four-position Quelle (source) switch in the Ausgang section determines the signals that reach your hushed audience. In the first position, just the raw sawtooth (sägezahn) oscillator will be heard, followed by the same waveform passing through either or both filters. In the final setting, 'F1+F2', both filters are heard in parallel. 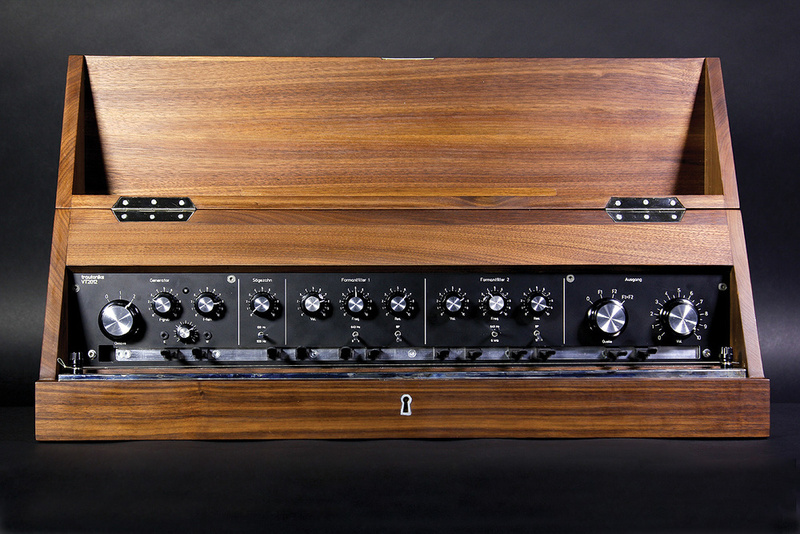 The sawtooth is characteristically rich with a volume knob its only control, apart from a simple 'prefilter' switch. The switch has three positions: 100Hz, off and 500Hz. The middle setting delivers the waveform in its pure state, while the others introduce passive low-pass filters that trim off harmonics. These subtractions act like basic EQ tweaks, but for more drastic processing you're going to want to select either of the filters. As Quelle is a big round selector knob, it can rapidly switch between the two filters, and therefore two separate tones. It isn't exactly patch selection, but it's as close as you get. At the 6kHz setting, the filters are at their most open and airy. Resonant manual sweeps invoke an almost Sherman-like ringiness, especially that perky filter one. Each filter has independent volume controls that, towards their maximum level, introduce mild distortion (and some audible background noise). When parallel mode is engaged, the separate controls permit subtle blending of the filters' outputs. For me, the Trautonium's best sounds fall somewhere between electronic and acoustic in appeal; it can shift from sizzlingly synthetic to almost 'real' in seconds. I'm sure I've heard echoes of saxophone, the hint of violin and the wailings of an oboe in there. Due to the static filter design, there was no way to add manual or pedal control of the filter cutoff. This rules out LFOs and envelopes as modulation sources too. In a standard synthesizer, these would be pretty serious limitations, even taking into account the unusual filters. Fortunately, there are two other crucial factors to consider: pitch and volume — specifically, the direct access to pitch and volume. I'm someone who isn't a regular player of a stringed instrument, so I found the pressure required to constantly press the arm gave me the grooviest fingertips ever, especially in first few hours of playing. The 'indents' became less of an issue as days and then weeks passed and my fingers toughened up. Eventually the discomfort was a distant memory and I began playing and even recording performances, this made extra-easy due to the addition of a dozen rubber 'auxiliary keys' placed along the wire. As set in the factory, the positions of the keys correspond to the notes C, D, G and A over a span of three octaves. If other marker notes or intervals would suit you better, the manual describes how they can be moved. Speaking as a novice Theremin player, I already felt spoiled! There was one aspect of performance I hadn't bargained for: even when you begin with pristine, grease-free fingers and a shiny, polished manual, this idyllic condition won't last long. That metal plate can become quite sticky over a long session. You're advised to clean before and after playing in order to maintain contact reliability, but performance and sweating go hand in hand, so it's worth keeping a cloth close by at all times. Or experimenting with gloves, maybe. Happily, it's still a fast and expressive surface to play, whether you slide over the metal plate to reach every note or pound them in discretely. For this, you can press the string directly, or you can press one of the auxiliary keys to make the contact. The keys extend just far enough so that they don't get in the way, but you could trim them if you felt they were too long. Unsurprisingly, gliding from note to note produces a violin-like response, while picking out individual notes produces a brass or woodwind-type envelope. If you make contact with several fingers at once, the highest takes priority. For traditional control, a volume pedal such as a Yamaha FC7 or equivalent can be fun, but it's hard to beat the directness of pressure on the manual plate. Fortunately, your evolving Trautonium technique easily transfers to other synthesizers thanks to those CV/Gate outputs. In its role as controller deluxe, the Trautonium possessed the souls of favourites such as my Roland SH101 and Digisound modular, boosting them to new heights of expression. It's safe to predict that the Trautonium won't be a natural next purchase for the majority of Sound On Sound readers, but if money were no object, this one would be staying right here! The VT2012 sticks pretty closely to the classic sound and design of Trautoniums manufactured in the 1930s, which means that there are a limited number of tonal changes on tap. After all, this is a single oscillator instrument with no modulation except that provided by the performer, but it seems like much more. I quickly grew to relish the precision and speed of natural pitch-slides and the effects of human-generated vibrato and tremolo compared to the LFO-sourced equivalents on a synth. The gift of easily-located notes made a huge difference, and in a surprisingly short time I felt confident I'd hit the right interval every time. The filters provide distinctive tone shaping, and as you've got a hand free and knobs to grab, there are synthy-ish solos ready to be unleashed. I later changed my mind about the springs being too powerful — it was simply that my fingers were too puny! That hurdle passed, the Trautonium started to become the responsive and expressive instrument I always dreamed my Theremin would be. If this strikes a chord, maybe you're one of the people who believe the worst thing that happened to the synthesizer was giving it a keyboard. Finally, the CV and Gate outputs offer the chance to drive external synths, and for those of us who can't stretch to the full monty, Trautoniks promise a CV/Gate controller-only model. This will inevitably still mean a solid chunk of hardware with robust springs, and therefore a number of different cost options are being considered, including a kit version. As I'll be very sorry to part company with this one, I'll be watching developments closely. There are a number of ribbon synths and controllers around, but none that are mounted on a sprung metal manual. 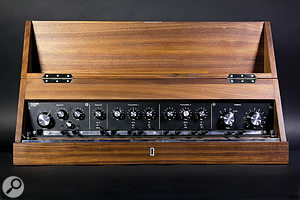 Doepfer's A198 Trautonium ribbon controller and associated modules are probably the most focused, especially as they include the sub-harmonic generators of the Mixtur-Trautonium. 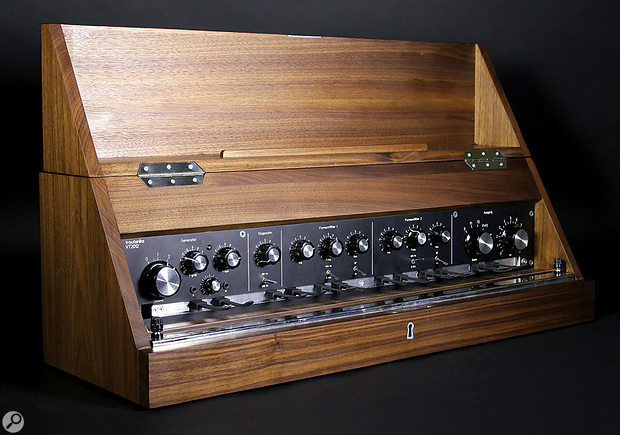 After that, there's the Analogue Systems French Connection — an Ondes Martenot-based controller. Its ring and string method of controlling pitch don't have quite the same feel of connection, and your left hand is occupied with volume, meaning that a certain amount of co-ordination comes into play. One other alternative that comes to mind is Hard Mod Electronics' Analog Ribbon Synth. This is a small Spanish company and I can't claim any first-hand knowledge of them, but their handmade synths could be worth a look. Arriving on the scene in 1930, Trautwein's Trautonium probably put paid to the darling of the time, the Spherophone, and with it the fortunes of its inventor, Jörg Mager. A significant moment in the Spherophone's decline must have been when the composer Paul Hindemith switched his allegiance to the Trautonium. It's well worth seeking out his Concertino for Trautonium and Strings as an example of this rare instrument in an orchestral setting. Initially, the Trautonium's sound generation was based on neon tubes, quickly replaced by thyratron tubes and then transistors, all of which had one thing in common: they generated sawtooth waveforms. The Volkstrautonium (volks meaning 'people's') was one of the earliest commercially produced electronic instruments, but at most this amounted to a couple of hundred units manufactured by German company Telefunken until around 1935. Composers such as Richard Strauss, Werner Egk and Harald Genzmer also wrote for the Trautonium, but the word never spread widely beyond Germany. One name firmly entwined in Trautonium lore is Oskar Sala, its best-known virtuoso. If you listen carefully to the Hindemith Concertino, you'll hear fast flurries of notes delivered while riding the cutoff knob, laying a path for prog-rock wizards to follow. Sala was a pupil of Hindemith and not against some technical hands-on of his own. Indeed, he was the major force of the instrument's continuing development, his Mixtur-Trautonium having two independent strings and increased sonic complexity, thanks to the inclusion of sub-harmonic oscillators. In one of his many cinematic outings, Sala provided the unsettling sound effects for Alfred Hitchcock's film The Birds, while his studio creations 'Elektronische Impressionen' still sound challenging today. 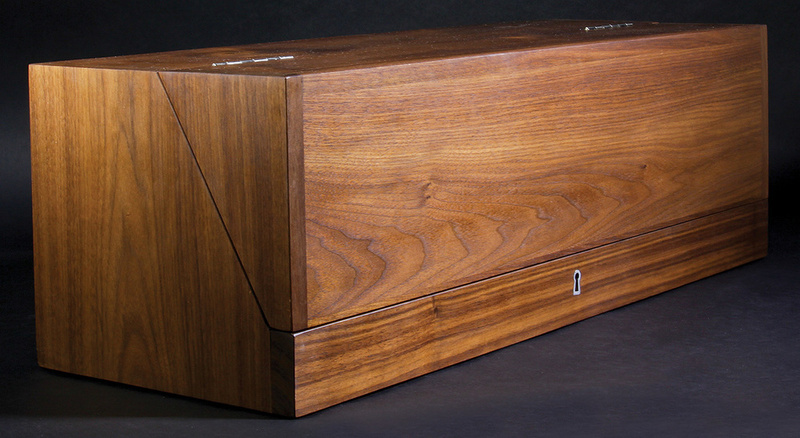 An elegant, expressive electronic musical instrument. Auxiliary pitch marker keys make getting started a breeze. Instruments of this quality don't come cheap. The tones from its single sawtooth oscillator and twin filters are fairly limited. The Trautoniks Trautonium is a boutique slice of musical wizardry dating from the earliest days of elektronische musik. It's intimidatingly expensive, but instantly playable, offering a degree of performance control rarely seen in production electronic instruments. Schneider's Laden +49 (0)30 9789 4136.